Well hello there friends. Happy Thursday to you all. A week ago I had a venting session about how overwhelmed I was with the SCD and how I wasn’t sure if I could continue to follow it as closely as I had been. I wrote that post at the end of a long work day and on a day when I wasn’t feeling well. Needless to say, my thoughts at that moment were most likely hinged to the fact that I was in fact exhausted, but not because I couldn’t handle the food preparation and the details of the SCD, more because I had a rough week. Since my vent session, I have continued to follow the SCD very closely, sticking to “legal” foods and progressing with the diet at a rate based on my own health status. I have been doing very well with sticking to the allowable food items. I am really learning to pay attention to my body and how it reacts to different foods and activities. I continue to experiment with introducing foods back in to my diet to see how my body reacts (I learned I wasn’t ready for raisins—I knew better too). I am about 2 1/2 weeks in to the SCD and I am feeing well, but still not 100%. It is rare that I have a “bloaty” day, and if I do, I can usually immediately associate it to a certain food that I ate, or correlate it to not eating as frequently as I should throughout the day, not drinking enough water, etc. I continue to see the gastroenterology specialists who are treating my U.C. with medications, and who are fully aware that I am following this diet. I will continue to heal and share my journey with you all. It has been about two months now that I have been in this “flare” stage, but it feels like it’s been a whole lot longer than that. Thank you all for supporting me through this process. I can only hope that I am helping someone else out there who is facing the same challenges as I am. On a lighter note, how about a Wednesday recap? 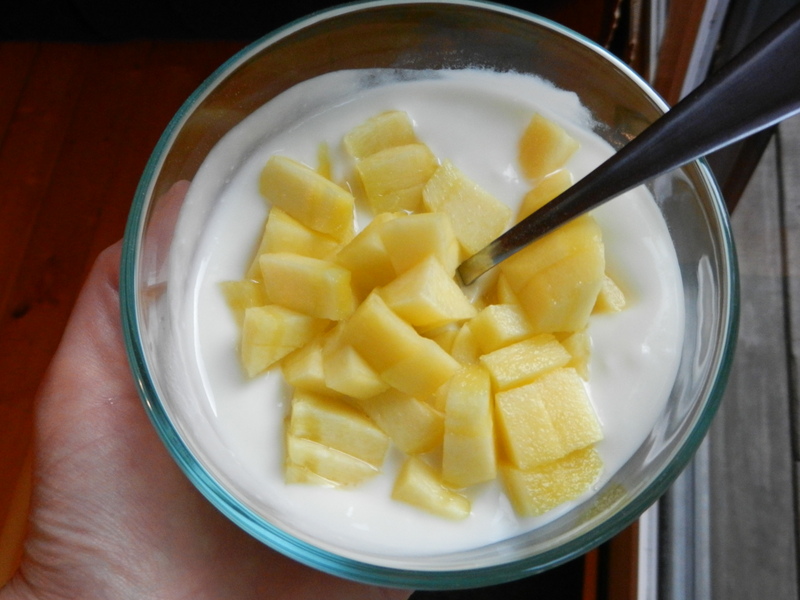 Breakfast: plain yogurt (SCD) sweetened with honey and topped with 3/4 of a peeled peach or maybe it’s a nectarine? Either way, it was delicious. Lunch: I didn’t get to snap a photo of lunch because I literally had to stuff my face in a couple of minutes due to getting out of work late and Moose deciding to upchuck in the living room. I grabbed peanut butter and a banana before I had to head back to work. 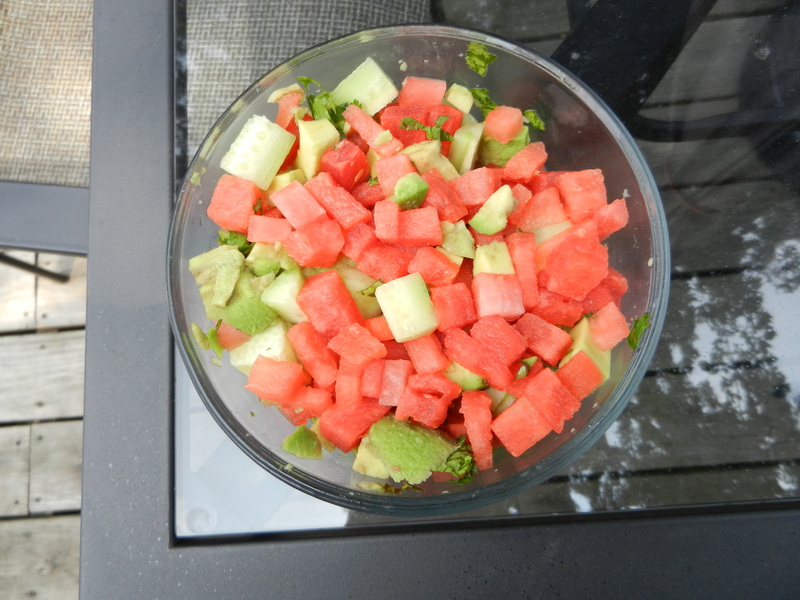 Dinner: After work I came home and dug into some more of that super juicy refreshing watermelon salad I made the other day. This was part one of dinner. 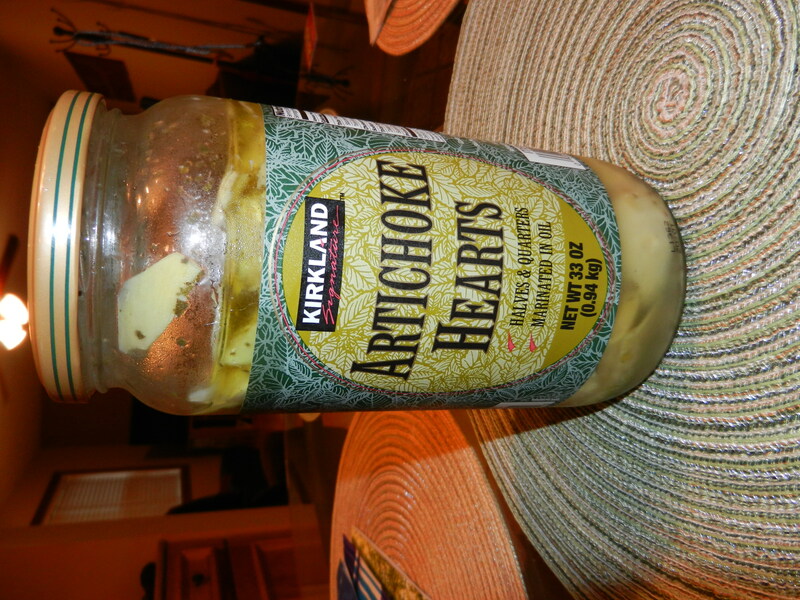 I had two artichoke hearts from Costco while I pondered dinner options. These babies are packed in oil, so I gave them a rinse in the sink before eating them. They are very tasty! Dinner part two. I was completely indecisive about what to eat for the more substantial portion of my meal. 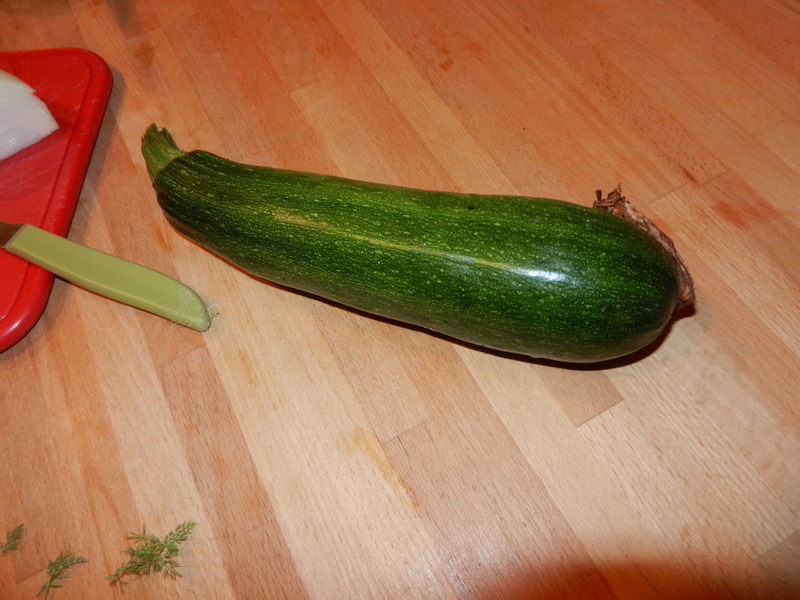 In the meantime, I meandered out to the backyard to check on the growth of one particular zucchini in the garden (aka the only zucchini in the garden right now). To my delight, it was ready to be picked! Finally, our first one of the year. I have a feeling now that the first one has been picked, they are going to start shooting out like wildfire like they did last year. I am going to have zucchini coming out of my ears soon (I hope!). I can’t believe how fast they grow. Just the day before I picked it was at least 2 inches shorter I could swear. So clearly the next part of my dinner had to include the zucchini. I remember an idea I saw on Pinterest for some sort of zucchini pizzas, and I ran with the idea. First, I cut the zucchini into 5 mini rounds. I blotted each one with a paper towel to remove some liquid. Ideally, I would have like to let these sit in a colander with a sprinkle of salt for 20 minutes, and then blot them off with a towel, because I would be able to remove even more liquid. But since I was not in the mood to wait 20 extra minutes, I forged ahead. I got the oven preheating to 375°. I prepared the zucchini bites on a piece of aluminum foil (easy clean up). I sprayed the aluminum foil with non-stick cooking spray but in reality, I probably didn’t need to do that as there was so much water that came out from the zucchini in the baking process and I don’t think they would have stuck. 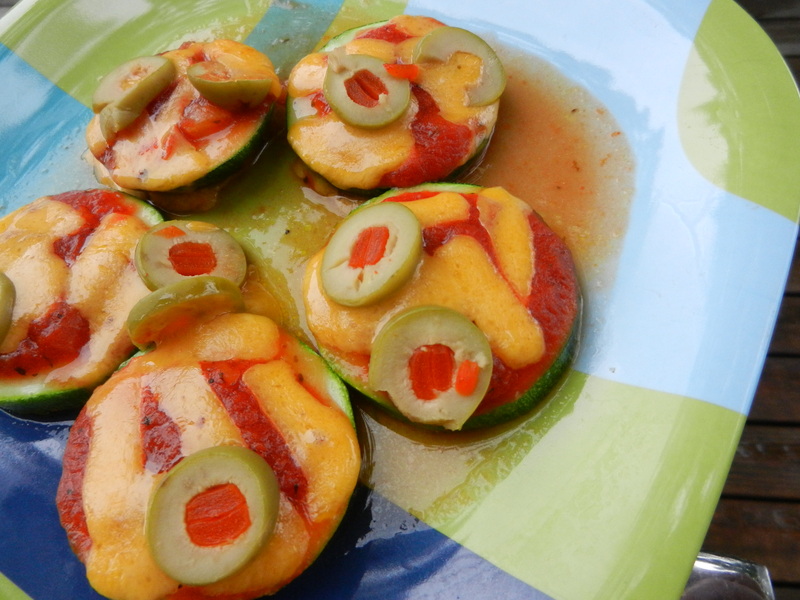 I then sprinkled garlic powder on the zucchini, then layered on a tablespoon of homemade marinara sauce, cheddar cheese, and chopped green olives, and popped these bites in the oven for about 10 minutes. After 10 minutes, I turned the oven to broil, and cooked for an additional 3 minutes until the cheese was melty. A quick, easy and healthy SCD meal in less than 20 minutes. Um, hello, yea! Dinner part three. I debated sprinkling some parmesan cheese on the top but decided they were cheesy enough as is. I would make these again in a heart beat. 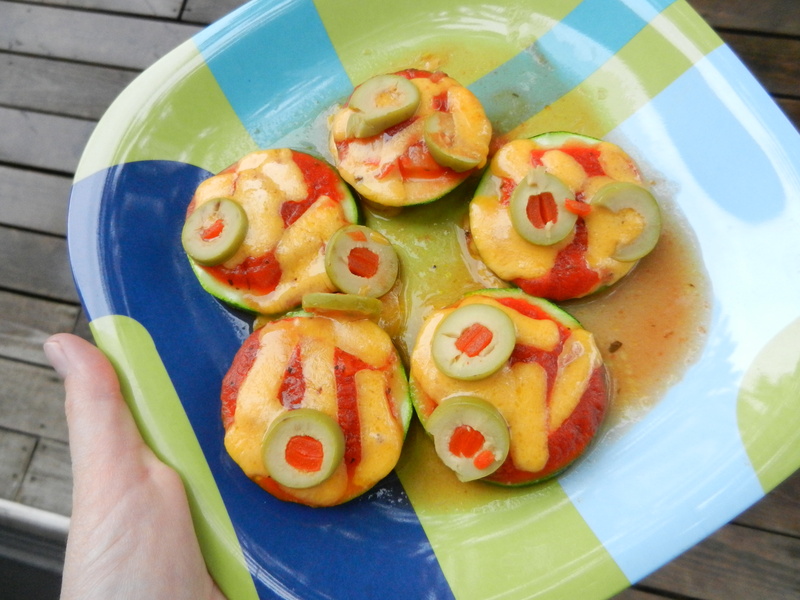 They would be perfect for little ones too or even a fun snack or appetizer option. Turn oven to broil and bake for an additional 3 minutes or until cheese is melted. Not too shabby for not knowing what I was going to eat for dinner, right?! Bring it on zucchini, I have a lot more plans for you. After dinner, I walked on the treadmill for an hour while watching Wheel of Fortune and So You Think You Can Dance. I am out for the day. Enjoy this day, and I will catch up with you later gators. This entry was posted in Breakfast, Dinners, Health, Recipes, Snacks, Workouts and tagged Food Trials, SCD, Snacks, U.C., Veggies, Yogurt by Melanie. Bookmark the permalink. Hi Maggie. Thank you for your comment. Yes I am aware that garlic powder (unless homemade) is not SCD legal but I was experimenting with adding different items back into my diet. My body handled the garlic powder just fine. I will update the recipe so readers are aware that it is not SCD legal.